The inaugural CicLAvia event last month was a tremendous success, and now planners are looking to get going on a repeat event for 2011. "The CicLAvia board is looking to host the next CicLAvia event in more-or-less the same 7-mile route as we did on 10-10-10 (more on some possible tweaks - soon!) 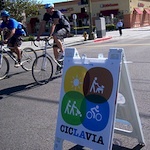 extending from East Hollywood to Boyle Heights," blogs CicLAvia. They&apos;re planning on a Sunday in April 2011, but want input from riders, residents, "area organizations, businesses, city agencies, Metro, etc." to help settle on a date that won&apos;t compete with other big events, or let them "dovetail" an appropriate event. Ultimately, there could be 4-6 CicLAvia events in 2011.